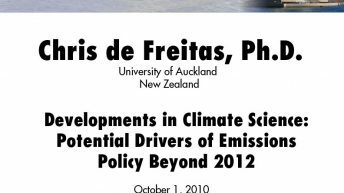 Chris de Freitas, Ph.D., passed away in July 2017. 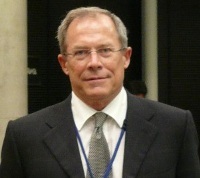 Chris de Freitas received his early education in Trinidad in the West Indies. He completed Bachelors and Masters degrees at the University of Toronto in Canada and a Ph.D. at the University of Queensland in Australia as a Commonwealth Doctoral Scholar. During his time at The University of Auckland he served as Deputy Dean of Science, Head of Science and Technology at the Tamaki campus and four years as Pro Vice Chancellor. 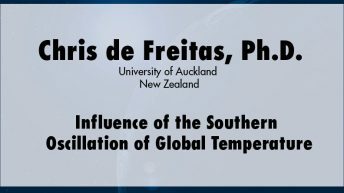 He had been Vice President of the Meteorological Society of New Zealand, Vice President of the International Society of Biometeorologyand and was co-founder of the Australia New Zealand Climate Forum. For 10 years he was an editor of the international journal Climate Research. 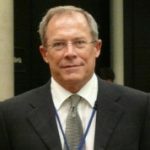 Chris was an advocate of open and well informed reporting on scientific issues and has written extensively in newspapers and magazines on a variety of environment-related themes, including air quality, flood and drought hazards, environmental conservation and climate change. In recognition of this, he had three times been the recipient of the New Zealand Association of Scientists, Science Communicator Award.